The Assassin’s Curse by Cassandra Rose Clarke and Aristotle and Dante Discover the Secrets of the Universe by Benjamin Alire Saenz. Both these books had been rattling about in my brain for a wee while and I finally managed to think of them side by side. Having looked at them both closely, the font actually isn’t identical but it does look extremely similar! After some further investigation, I think they were both drawn by Sarah J. Coleman who has done some really awesome work (check out her website here) and a whole bunch of great book covers which have the distinct mark of her work! 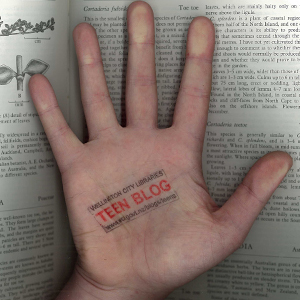 She certainly has a new fan over here at the teen blog! Oh and as for the books themselves, we’ve read both of them over here and both of them were great. Thumbs up! 08.02.13 | Permalink | Comments Off on Happy birthday Pride and Prejudice! In historical milestone news, last week (the 28th of January to be exact) marked the 200th anniversary of Pride and Prejudice by Jane Austen! It’s a great read with a cast of oddball characters, and it will take up that “classics” spot in your school reading log quite nicely. Pride and Prejudice and Zombies. Of course. The 2005 movie with Keira Knightley in it. Bingley, please. Prom & Prejudice, a modern retelling of P+P. Same names and everything! But set in a high school. The Lizzie Bennett Diaries, an online video series adaptation in the form of vlogs. It is super good! Also, it was co-created and developed by Hank Green of vlogbrothers fame i.e. brother of John Green. This excellent cartoon summary version. Check it out in real life to see the extent of its prettiness – bright coloured page edges, embossing and a silky matte cover. It’s designed by Jessica Hische (my favourite graphic designer!) and you can see a few more from this series on her website. Happy P+P anniversary, enjoy in any way you wish!